A medical device manufacturer sought to leverage automation to reduce costs, drive greater efficiencies across all business functions, eliminate errors, and free employees from repetitive tasks. The company chose Automation Anywhere’s digital workforce platform, which includes RPA. This move significantly increased efficiency across end-to-end processing. For example, 1 request that impacted 50,000 users was fulfilled in a few minutes. 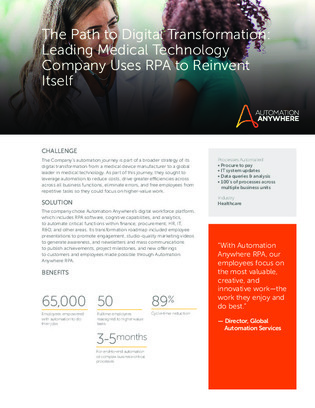 Read this case study to learn more about the results that this medical device company experienced with Automation Anywhere’s RPA platform.